High on a hill overlooking the village of Laguna sits the beautiful white church of Saint Joseph. In 1697, people from other areas began living in the fertile valley and in 1699, the pueblo and the parish was ‘formally established under the name of San Jose de la Laguna.’ It was then under the jurisdiction of the Bishop of Durango. This mission, dedicated to St. Joseph, the foster father of Our Lord, was established in the year 1699 by Friar Antonio de Miranda, O.F.M., one of the early Franciscan Missionaries in New Mexico. It is one of the last established of the early New Mexico Missions, and is the best preserved, in its original condition, of all the Old Missions in the Southwest. The Pueblo of Laguna, named after a lake that was a short distance west of the village, is the only Pueblo established after the coming of the Europeans to America. It was settled by a number of Acoma, Zuni and Queres Indians from Santa Fe, in the first term of office of the Reconqueror of New Mexico, General Don Diego de Vargas (1691-1696). But it was not until July 4, 1699 that Laguna took the oath of allegiance and obedience to Spain and received the name of San Jose de Laguna from the Spanish Governor, Pedro Rodriguez de Cubero. Soon after this official establishment the leaders of the Lagunas sent a delegation to Governor Cubero at Isleta to ask for the services of a priest. They were told by the Governor to return to Laguna and prepare a place of worship. The people of Laguna, according to their tradition, immediately built the front part of ‘the present convent, and soon after July 4, 1699 Friar Antonio de Miranda, O.F.M., was sent to minister to them. Again, according to their tradition, upon the Padre’s arrival he called a meeting of the people and work was begun on the present church building. In a short time the church was completed by the Laguna Indians under the direction of Friar Antonio and Holy Mass was celebrated in this Mission church before the end of the 17th century. San Jose Mission is built in the early Pueblo-Franciscan style of architecture, but unlike the other older churches, it is constructed of stone and adobe mortar instead of the customary adobe or mud bricks. It is 105 feet long and 22 feet wide inside. Since this Mission was built after the great Pueblo Revolt of 1680 (August 10), it has enjoyed a peaceful existence with the exception of a few years in the past century when there was religious trouble at Laguna. 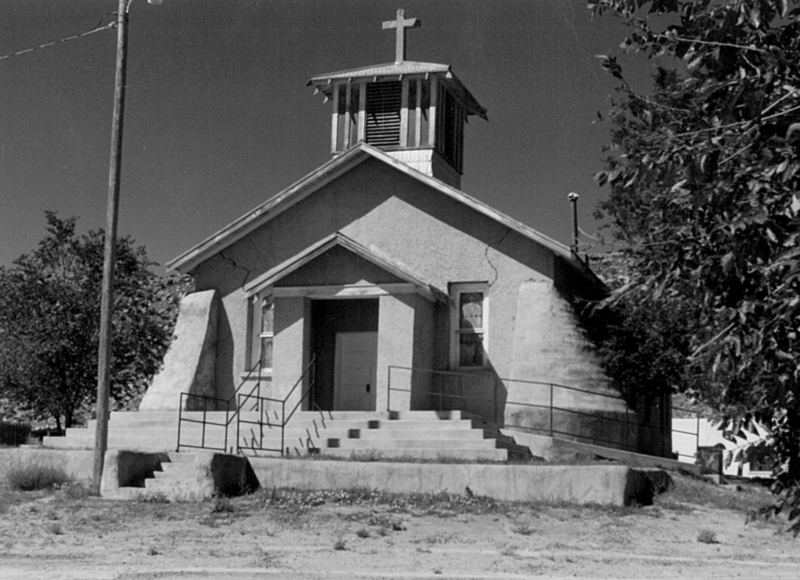 At that time this church was used as a stable, but this unholy condition was soon remedied when the Catholic Indians again came into power in the Pueblo. 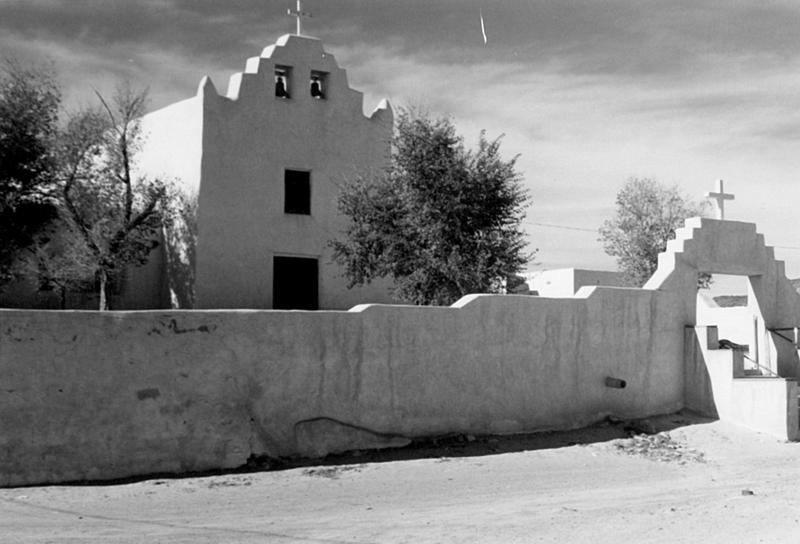 Because of the Secularization Laws of Old Mexico (1820) the old convent adjoining the Mission church was not used by the Padres and it fell into ruins. 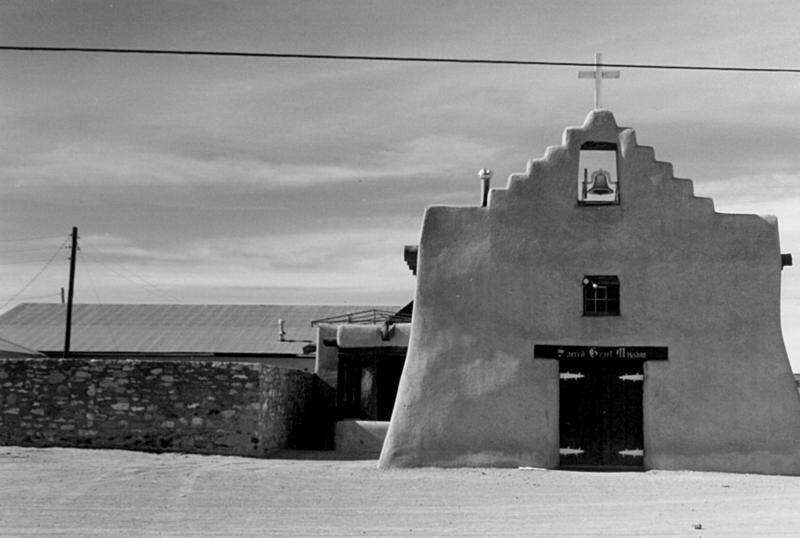 During this time one priest had charge of the Missions of Isleta, Laguna, Acoma and Zuni. For many years the front rooms of the old convent were used by the Laguna Indians as a meeting place. 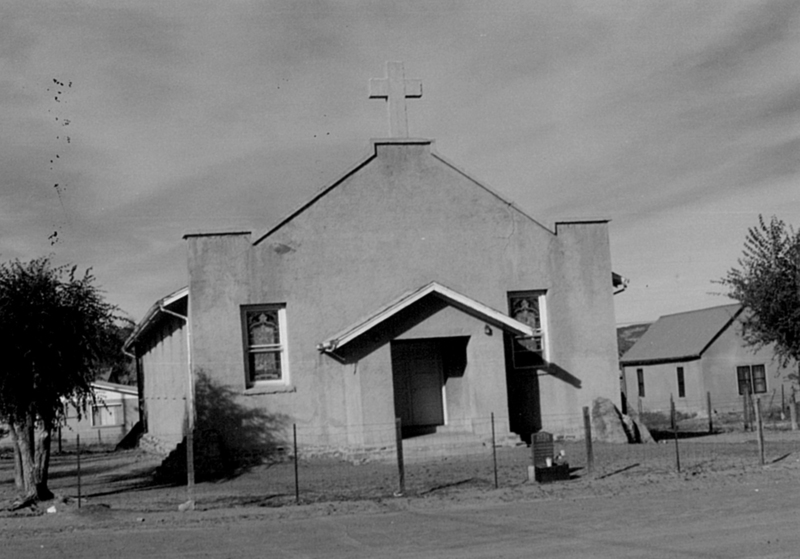 On September 10, 1932 an agreement was reached by the Priest in charge and the Officers of the Laguna Indians, whereby the old convent was turned over to the Church. Logs for a new meeting house were purchased by the priest. Work on the restoration began on October 4, 1932, but because of lack of funds it had to be discontinued. With the help of some Laguna men and women who volunteered their services, work was again started on March 9, 1933. But again it had to be stopped until April, 1934 when the ﬂoors and ceilings were completed. However, it was not until April 12, 1935 that the convent was ready for occupancy by the priest. In May, 1935 the south wing of the old convent was acquired from the Pedro Sheayea family who had been using it as a storage room for years. At this time a copy of the plan of the original Mission buildings was procured from the Historic American Buildings Survey of the U. S. Government. The old kitchen was restored on its original foundation in June. On July 20, 1935 the west wing was acquired from the Juan Martin and Pedro Sheayea families who had used it as a stable for many years. This was in complete ruins and the stable walls were razed to the ground. 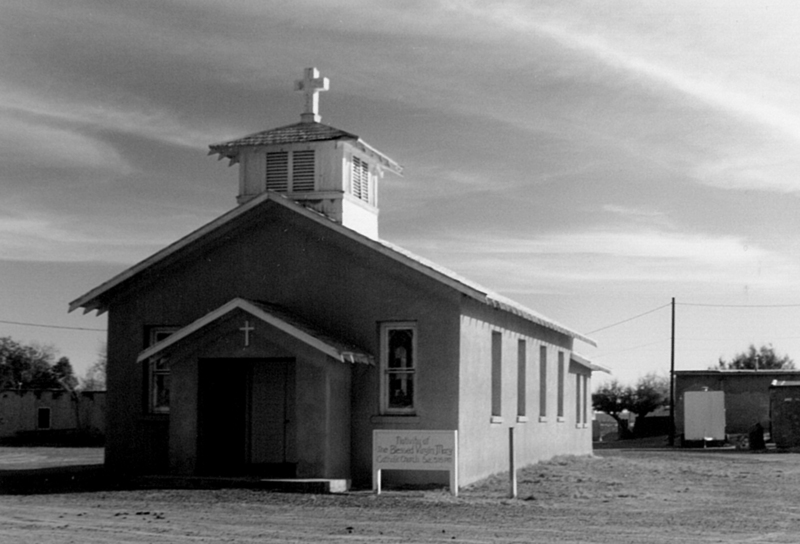 On September 9, 1935 two Sisters of the Blessed Sacrament arrived at Laguna to work among the Laguna and Acoma Indians. These two Sisters, Mother Jane Frances and Sister Norberta, lived in the south wing of the old convent. The Sacristy was converted into a temporary chapel where the Blessed Sacrament was kept until the completion of the little chapel to the west of the Sacristy in December, 1935. In the same month the Sisters dining room to the east of the kitchen was built on the old foundation. In September, 1936 the restoration work on the west wing began. This two-story building is the only part of the old convent completely restored. (Originally the entire convent was two stories high.) The Sisters moved into this building on January 15, 1937. By this time the Plazita, which the wind and the weather had ﬁlled with eight feet of sand and debris, was cleared and the Monastery garden restored. This work of restoration was made possible by donations from the Franciscan Missionary Union of the Province of St. John the Baptist, Cincinnati, Ohio, from the Most Rev. Rudolph A. Gerken, D.D., Archbishop of Santa Fe, from Mother Katherine Drexel, Foundress of the Sisters of the Blessed Sacrament, Cornwells Heights, PA, from the Bureau of Catholic Indian Missions, Washington, D.C., and from donations given by visitors to this Mission. 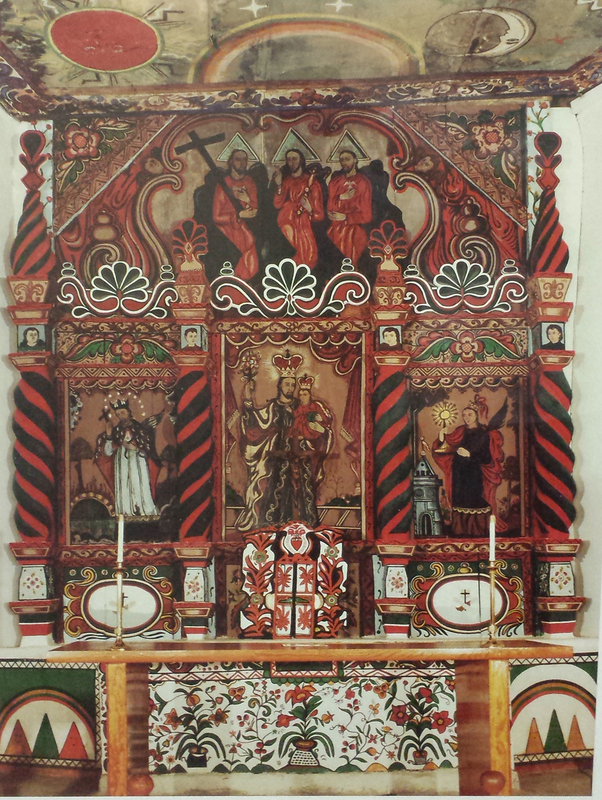 The Hand-Carved Altar – hewn from native pine logs and colored by the Indians. The Early Spanish Altar Paintings. On the right, a painting of St. Barbara – venerated as Patroness against Thunder, Lightning, Firearms and Sudden Death. On the left, a painting of St. John Nepomucene – venerated as Patron of Water and the Seal of Confession. In the center, a painting of the Patron of this Mission – St. Joseph. Above, a painting of the Blessed Trinity. The Unusual and Striking Painting on Hide, above the altar, consisting of symbols representing the rainbow, sun, moon and stars surrounded by Christian symbols. Near the sun are two white stars representing morning, near the moon, eight yellow stars representing night. This combination of Christianity and the old religion of the Indians shows the attempt of some early Padres to elevate the minds of the people from the worship of the elements themselves to the God who made them. The Richly Decorated Antipendium, painted on hide – below the mensa of the altar. The Unique Tabernacle where the Blessed Sacrament was kept. The Large Painting of St. Joseph and the Christ Child, on the Gospel side of the sanctuary. This is one of the largest paintings on elk skin in existence. The Old Statue of St. Joseph. This hand- carved statue was brought to this Mission in 1699 from Old Mexico, and ever since, has been highly venerated by the Indians. According to their tradition, this statue was dipped into the river that passes around Laguna and to this day the river is known as the San Jose River. Every year on the Fiesta days (March 19 and September 19) and in times of trouble and stress, this statue is carried with great ceremony and reverence through the village. The Old Statue of the Blessed Virgin. This statue, taken from this church by the Catholic Indians and buried for safety in the time of the religious trouble of the past century, was found and returned to this Mission in 1935. The Hand-hewn Pulpit and Old Confessional. The Unique Paintings Along the Sides of the Walls. The mounds represent the tombs, while the doves represent the souls of the faithful buried in this church. The Hand-carved Stations of the Cross depicting the sufferings of Our Lord on His journey to Calvary. The Large Painting of Purgatory and the Poor Souls. The Laguna Indians have a deep devotion to the Poor Souls. On Poor Souls Day, November 2, they bring their ﬁrst fruits as offerings to the church. These consist of Indian colored corn and other produce from their ﬁelds. The Original Colored “Herring Bone” Ceiling, composed of cedar branches. The Old Vigas or beams that support the ceiling and roof. These logs had to be carried a distance of at least 30 miles on the shoulders of the Indians of that time. The Hand-hewn Corbels, with supports under the logs, hewn from logs with crude tools. The Front Doors. The carving on the right door is a replica of the Coat of Arms of the Bishop of Durango, Mexico, under whose jurisdiction this Mission was built. The carving on the left door is a replica of the Coat of Arms of the Franciscan Order, the founders and present Missionaries at this Mission. From 1850-1939 this Mission was in the Diocese and Archdiocese of Santa Fe, New Mexico. At the present time it is under the jurisdiction of the Most Reverend James S. Wall, Bishop of the Diocese of Gallup. In 1910, when the Franciscans returned to New Mexico, priests began visiting the pueblo and its outlying pueblos more often. One of them, Father Fridolin Schuster, OFM, directed the construction of three of the mission churches in the growing satellite villages. The first to be constructed was the church of St. Elizabeth in Paguate, dedicated on June 16, 1920, by Archbishop Albert T. Daeger, OFM, of Santa Fe. Paguate, a Laguna Indian Village, with a population of 684 souls in 1941, may be found twelve miles north-east of Laguna and eleven miles northeast of Highway 66, possesses a chapel dedicated to St. Elizabeth of Hungary. The construction of the Chapel was begun in September, 1919 and on June 16, 1920, the Most Reverend Albert T. Daeger, OFM blessed the chapel, built by Fr. Fridolin Schuster, OFM. The fiesta date is September 25th. Construction began on the church of the Nativity of the Blessed Virgin Mary in Encinal the following month. Encinal, another Laguna Indian village, can be seen fifteen miles northwest of Laguna and six miles north of Cubero and has a population in 1941 of 154 souls. The Chapel at this village, called “Nativity of the Blessed Virgin”, was built by Fr. Fridolin Schuster, OFM in the period from August 1920 to August 1921. The Archbishop of Santa Fe, the Most Rev. Albert T. Daeger, OFM, DD, dedicated it on September 8, 1921. The fiesta date is September 8th. Father Fridolin had yet another church to construct. Seama, a village with a population of less than 500, is located ten miles west of Laguna and one mile south of Highway 66. On July 26, 1924, Archbishop Daeger dedicated the church at Seama to St. Anne. The fiesta date is July 26th. These three sturdy churches in similar styles stand quite unchanged today. In 1932, when Father Agnellus began his assignment at Laguna, he undertook the construction of four more churches, two of them in Laguna villages. In Mesita, there was an old chapel, built in 1915 and dedicated to St. Anthony. This was used until 1936, when the new chapel was completed and dedicated to the Sacred Heart of Jesus on September 14 by Archbishop Rudolph A. Gerken of Santa Fe. Mesita lies six miles east of Laguna and one mile north or Highway 66. The fiesta date is August 15th. A Laguna village which is seven miles west of Laguna and half a mile north of Highway 66. A chapel dedicated to Saint Margaret Mary was built in Paraje with the ceremony on July 20, 1935, by Archbishop Gerken. 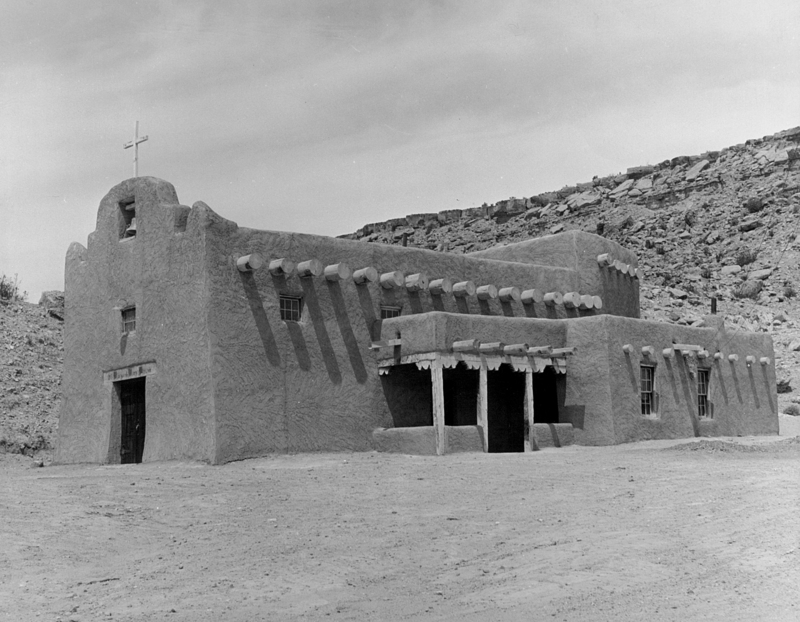 Father Agnellus, along with his father and brother, provided much of the labor themselves, working with the village residents to complete the beautiful Pueblo-style mission chapels. The Laguna people still regard the church of San Jose at the main pueblo as their “mother church” and are usually in attendance at the principal feasts. Feast celebrations are held at all the small villages in honor of their patrons. The Franciscan priests are still in charge of this large and active parish. The history presented here was taken from the writings of Elizabeth Kelley and documents in the Diocesan archives.